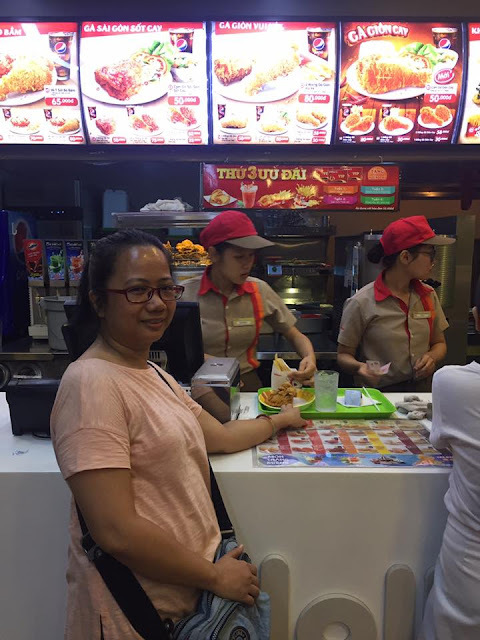 I promised myself that I won't eat in fast food places when I travel but upon seeing several branches of Jollibee around Ho Chi Minh City made me change my mind. 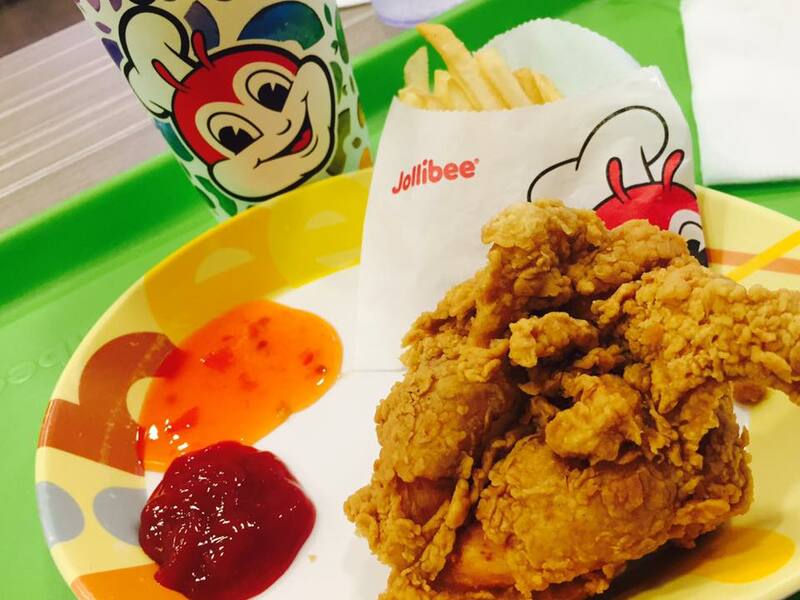 I just have to have a bite of Jollibee! 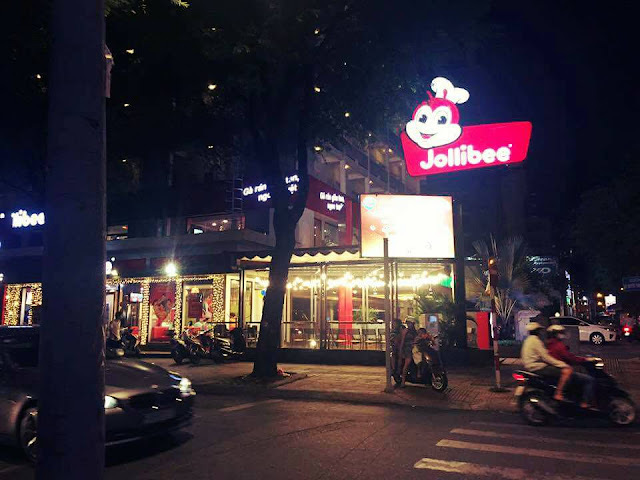 The place looks similarly familiar to ours, except that the amount is in Vietnamese Dong, and some of the food choices are not available here in the Philippines. It was almost 9pm when my friend and I arrived at Jollibee but the place was still full. The store closes at 9pm but they still allow people in. What I noticed though in this particular brand is that there seem to be an endless motorcycle-riding customers who buy take-outs. Vietnam is also known for favoring motorcycle as mode of transportaion. Aside from that, there are several families dining with some of the kids doing their homeworks inside Jollibee. 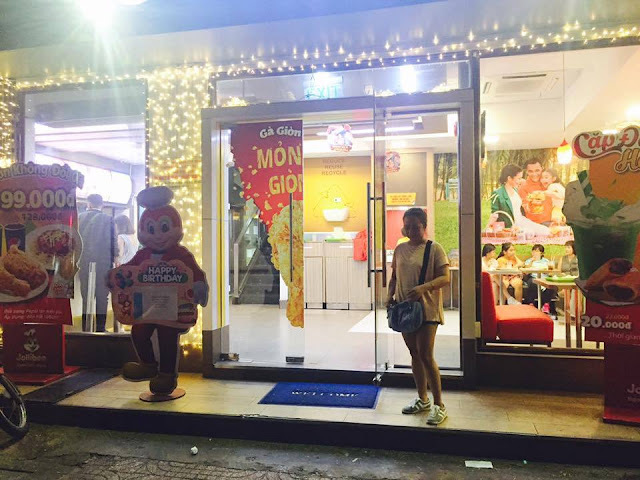 Wow, kids really love Jollibee. As for the interiors, it has more splash of colors- yellow, apple green, red, and violet which makes it feel homey. Some of the meals available include salad. Wow! I guess its because vegetables are a staple in a Vietnamese diet. Then there's iced green tea and milk tea drinks. 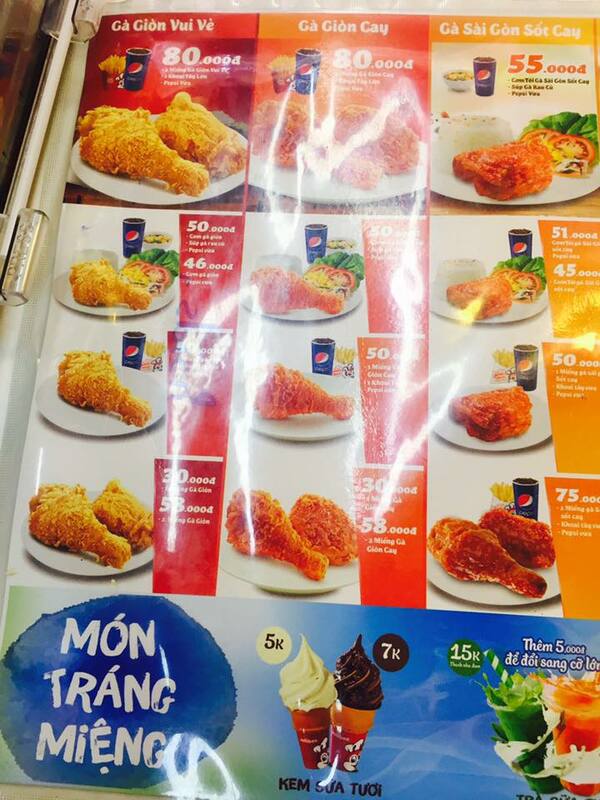 So hard to choose when there are so many unknown food combination. Can you guess what I ordered? Here's the iced green tea that costs VND 15,000. 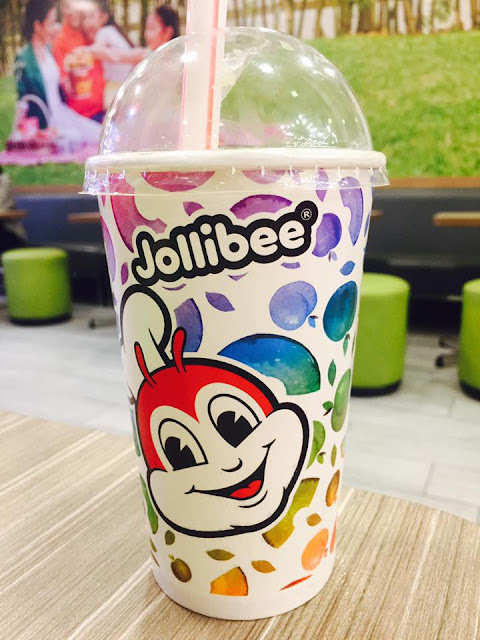 I love the 'jolly' looking disposable cup. I wish we have that here in the Philippines, too. It was actually my friend who ordered the green tea drink since mine came with soda (I think I got root beer). I had a sip or two and it was delish! 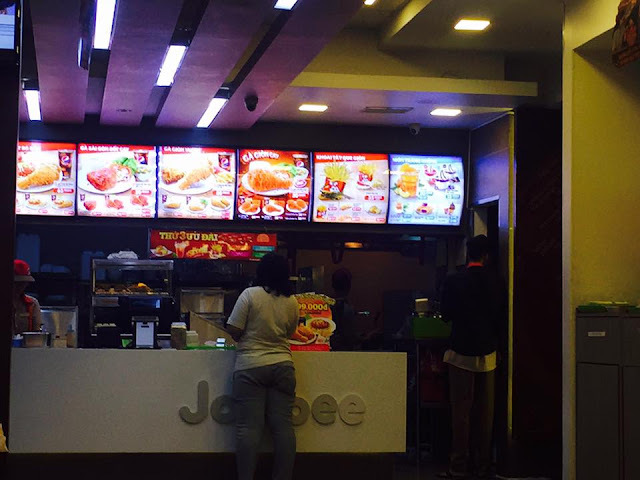 Must try if you are going to dine at Jollibee Vietnam. 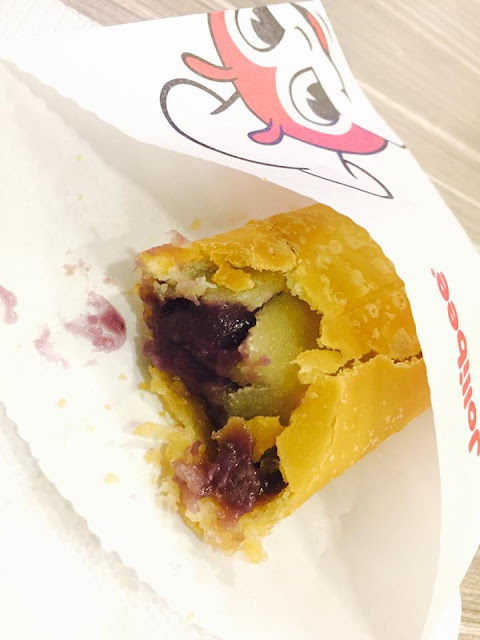 Here's my favorite find at Jollibee Vietnam though-- Taro Pie. And it is so good! Imagine the choco- mallow pie but instead of chocolate and marshmallow, it is filled with ube jam that tasted like it came from Good Shepherds and served warm-- heaven! So here's the Jollibee branch where I had my late dinner. This is somewhere in District 1 in Ho Chi Minh City. 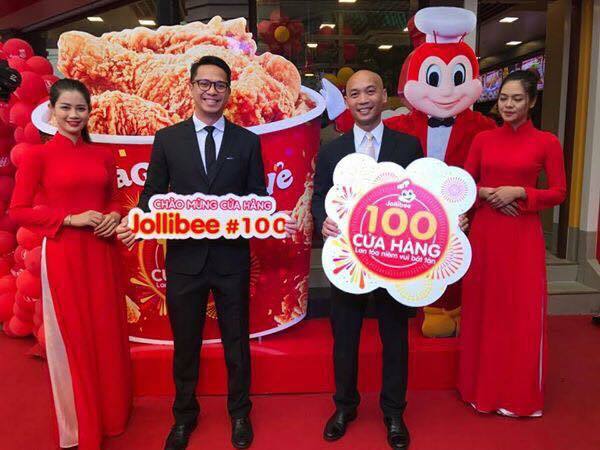 And on a happier note, Jollibee just opened its 100th store in Vietnam. Xin Chuc Mung!